After backpacking out the 11-mile Kalalau Trail along the Na Pali Coast, we had time to explore some of the more intriguing sites near the trailhead at Kee Beach and Haena on the north shore of Kauai. Just around the corner from the Kalalau trailhead is Keahualaka Heiau which overlooks Kee Beach and is dedicated to Laka for the practice of hula. In old Hawaii, the best and the brightest from all the Hawaiian Islands traveled to Keahualaka to learn the wisdom, traditions, chants, and dances of this ancient art form which is central to the Hawaiian culture. Keahualaka is also a site in the epic tale of Hi’iakaikapoliopele which involves Pele (the volcano goddess), Hi’iaka (the youngest and favorite sister of Pele), and Lohi’au (Kaua’i’s handsome and talented prince). 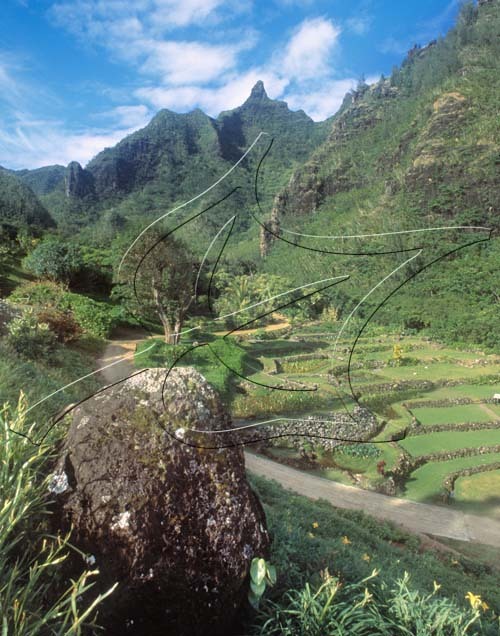 Related to the ancient site of Keahualaka is the Hawaiian settlement of Limahuli Valley which is less than half-a-mile from the Kalalau trailhead. Limahuli Valley is home to the most photogenic Hawaiian terraces I have ever seen. In the photo above, the twin spires over Kee Beach, known as “Mauna Puluo” and “Mauna Ho” (although you can only see one spire clearly in the photo above) tower over the back of Limahuli Valley. The boulder in the foregound, known as “Pohaku O Makana” acts as a guardian that watches over the entrance to the valley. 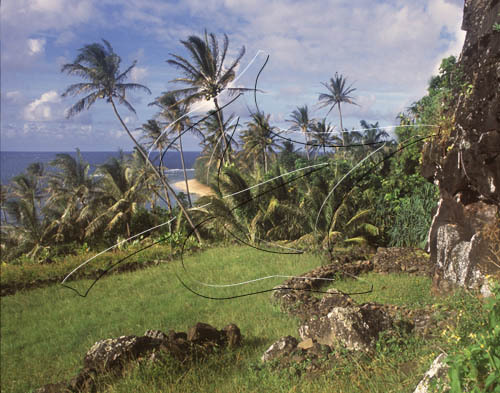 Archaeological evidence suggests that Limahuli was one of the first valleys inhabited by the Polynesians who transformed the landscape for the cultivation of kalo (taro). 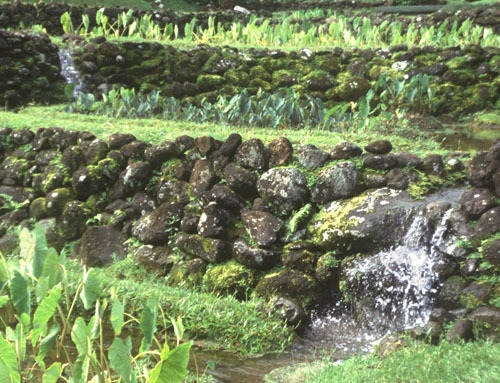 The National Tropical Botanical Garden painstakingly restored the terraces originally built in ancient times by the Hawaiians. 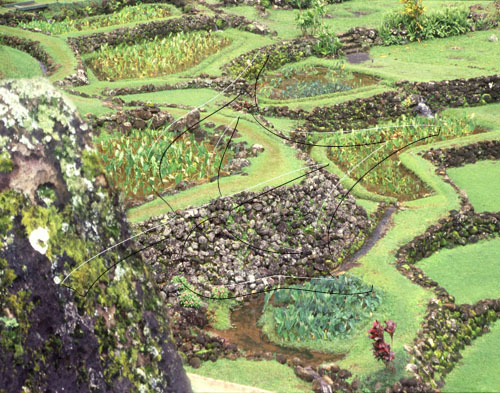 The auwai (system of irrigation ditches) has been restored so that water flows from one level of terraces to the next. Different varieties of kalo (taro) have been planted in each lo’i kalo (taro patch) formed by the terraces. 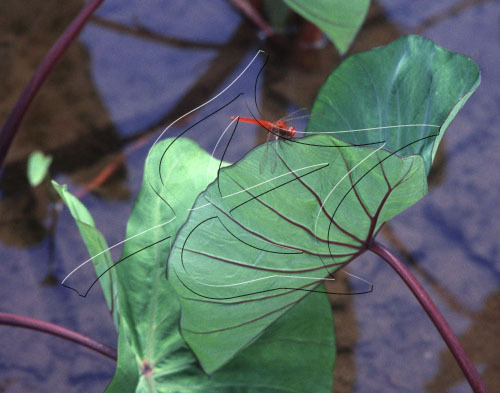 Dragonflies thrive in Limahuli Valley as they dart about from lo’i kalo (taro patch) to lo’i kalo, hover over the water, and rest on kalo (taro) leaves within the terraces built by ancient Hawaiians. Limahuli Valley and Keahualaka are amazing places to visit. Anyone backpacking the Kalalau Trail should take the time to explore these fascinating sites near the trailhead. This is the 9th blog entry in a series of posts about my Kalalau backpacking adventure with 14 HTMC friends over the Labor Day weekend. The previous (8th) entry is here and the next (10th) entry is here.